Complete the educational requirements to take your state examination and obtain an Arizona Department of Real Estate Salesperson license in just three weekends! Convenient Flagstaff N. San Francisco Street campus location; live classroom instruction taught by industry professionals; comfortable learning-centered classroom, excellent reputation; more than 140 successful graduates; text, quiz, and test materials provided. Prices subject to change. Verify current pricing direct with the school. Thank you. Taught on an interesting and effective case study format, this is a truly advanced study of Arizona brokerage. 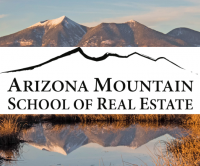 It is scheduled for busy real estate salespeople and students throughout Northern and Central Arizona who travel to class. Flagstaff campus; seating is limited. Call the school for current pricing & schedule. Broker Management Clinics I, II, and III, needed for specific broker license renewal and to activate new licenses. Three, 3-hour C.E. classes in Commissioner's Standards. Required for renewal for many Northern and Central Arizona Broker Licensees $25 per course; $50 for all three. Pay at the door. Walk-ins welcome! CLICK TO EXPAND UPCOMING CLASSES Watch our main website (www.Azmtschoolofrealestate.com) for a list of 2017 offerings of basic license renewal courses.